How to use the tutorials and examples? A guided tour of some \(\omega radlib\) notebooks. Get help and connect more than 120 users at the wradlib user group! Fork us from https://github.com/wradlib/wradlib or raise an issue! Get it here for Windows, Linux, or Mac. and pass metadata as dictionaries. In the next cell, type wradlib. and hit Tab. Inpect the available modules and functions. This notebook shows you how to access various file formats. 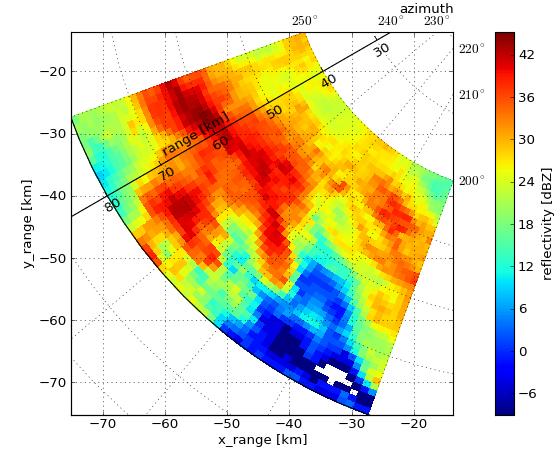 In this example, we reconstruct path-integrated attenuation from single-pol data of the German Weather Service. wradlib provides several methods for clutter detection. Here, we look at an example that uses dual-pol moments and a simple fuzzy classification. In this example, wradlib attempts to quantify terrain-induced beam blockage from a DEM. In this example, we compute zonal statistics over polygons imported in a shapefile. Often, you need to present your radar data in context with other geodata (DEM, rivers, gauges, catchments, …). In this example, we use synthetic radar and rain gauge observations and confront them with different adjustment techniques.